Fitness Coffee has 16 natural herbs to help your body fight oxidation, increase metabolism (who doesn’t need that?) and purify the body to increase energy. 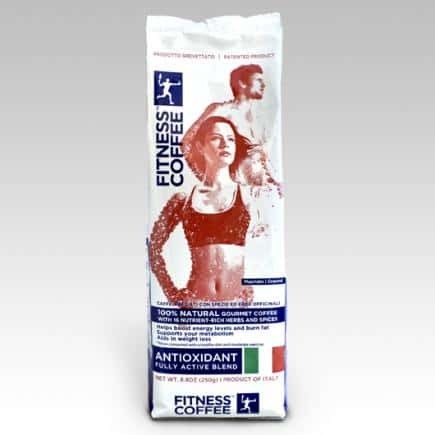 Fitness Coffee tastes delicious and includes yerba mate, licorice, mint, cinnamon, bitter and sweet orange, ginger, green tea, cardamom, lemon vervain, Chinese star anise, green anis, cloves, rodiola rosea and turmeric. I really wish you could smell my cup of steaming Fitness Coffee as I sit and write this review because the scent and taste of the blend of herbs and coffee beans is simply exceptional. I appreciate that this coffee does not contain any artificial ingredients, flavors, colors or preservatives or added sugars and no GMO’s. 68% polled in a blind taste test said they would prefer Fitness Coffee to their current coffee. What I liked best is that one cup gave me what felt like a burst of energy without feeling jittery. For me, it is great to have more energy when caring for three young children every day and not have those jitters to go along with it.